When B woke me up last Saturday on the afternoon of 8th March, I was still caught up in a deliciously lazy dream. I couldn’t remember what it was about but any thought of spending some time to recollect my thoughts on the dream immediately vanished when B said that a Malaysian Airlines plane was missing and Jun was on board! The only Jun I know is B’s friend and schoolmate, a long-time steward with Malaysian Airlines so could it be him B was referring to? In the midst of my drowsiness, I initially took it all as part of a bad dream. It was only ten minutes later, while sipping my first coffee of the day that the full intensity and urgency of the situation dawned upon me. Malaysian Airlines MH370 flying from Kuala Lumpur to Beijing with 239 passengers and crew members (including Junaidi Mohd Kassim) on board had mysteriously vanished! We are now into the 5th day of searching for the missing MH370 and the poor passengers and crew aboard the plane. I have been glued to the television since Saturday and all I’m seeing is sheer sadness. 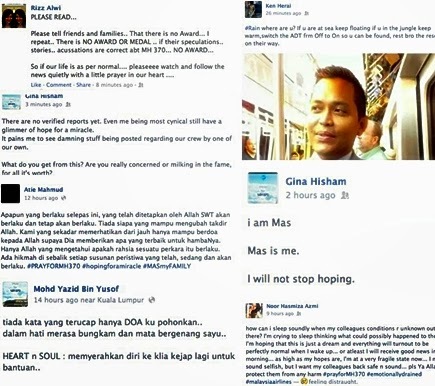 The mystery of the missing plane remains just as murky, if not even more and try as we may, we too can’t refrain from coming up with our own theories on what could have possibly happened to MH370. 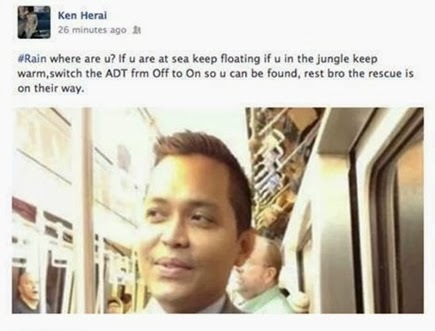 Where is MH370? Is she hiding somewhere on a LOST island waiting to be discovered? Are the passengers and crew members surviving the best they can just like the courageous survivors of ALIVE (based on true story) did? Times like this, you tend to come up with whatever scenario you can conjure in your head in order to make the pain of seeing the sadness of reality unfold, just a tad more bearable. Today, it is reported that India and Japan have added to the force (currently 12 countries providing assistance) of the current SAR mission of flight MH370, which adds to the comfort of knowing that so many people from all over the world are coming together to provide us with the assistance that we truly appreciate. The mightier the search, the bigger our hope for a thankful miracle. Truly a devastating time for the entire world particularly the countries affected in this tragedy, tears are a constant companion in my household at the moment. Even my fur-kids are depressed. 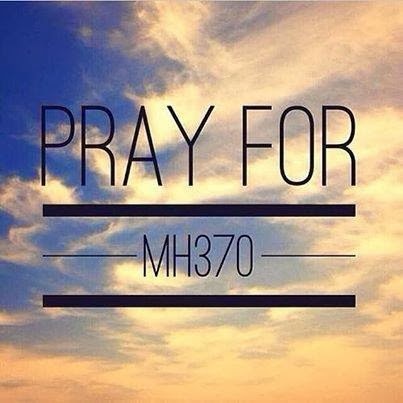 How can one not well up in tears at witnessing the severity of this tragedy and the added mystery surrounding the bizarre disappearance of MH370? I am choked with tears every time I see a heartfelt video or read a touching sob story about the 239 people on board and the agony each family is feeling at this no-closure loss. To date, there is still no trace of the missing plane or conclusive evidence suggesting wreckage has been discovered. 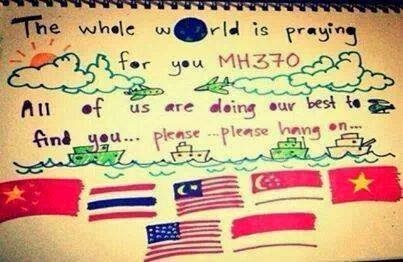 The entire nation remains in gloom albeit hopeful as we continue to pray, trust and will MH370 to emerge from her hiding place. 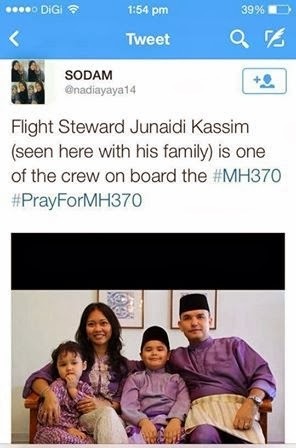 Keeping the faith; our thoughts, prayers and well-wishes go out to all the families of passengers and crew on MH370, especially to B’s friend Junaidi Mohd Kassim and his family. 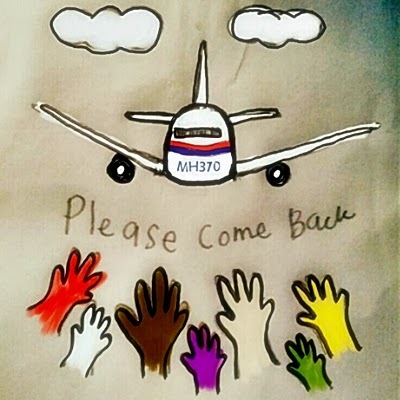 Please come back MH370. Miracles do happen and right now, the entire nation and the world is waiting with bated breath for you to make that difficult but courageous journey home with that longed for miracle.